A narrow, red-ground garment border, very finely woven in the slit tapestry technique in wool on a cotton warp, with some design details picked out in white cotton. Arranged in an alternating rhythm, the figures composed of curled hooks and triangles with minutely stepped outlines represent mythological hybrid creatures. – Small holes, good overall condition. Mounted onto fabric and attached to a wooden support with a perspex frame. Woven in the tapestry technique, this sheer wool fabric with a weft count of 73 wefts per centimetre is one of finest surviving weavings in the world. It is virtually impossible to make out the individual wefts with the naked eye. The textile must have been a burial gift for a high-ranking dignitary. A representation of a staff god in the Tiahuanaco style is surrounded by many symbols that are difficult to identify. – Signs of age and wear, several missing areas. Mounted onto fabric and attached to a wooden support with a perspex frame. Woven in white undyed cotton, this fragment of a figured fabric portrays six priests depicted in a front-facing posture with raised arms. The ground has been painted a brown colour, and the white figures appear as undecorated spaces. – Cut horizontally along the centre and rejoined. A man’s tunic (unku) of the Nazca culture, coarsely plain-woven from the wool of South American alpaca camelids. The sixteen vertical rectangular compartments in red, dark brown, yellow and green are stitched together along their sides, creating an impressively abstract textile picture reminiscent of 20th century modern Western artworks, although of course they are unrelated. The textiles have survived as burial gifts in the dry climate of the coastal desert of Perú. – Obvious signs of age. Mounted onto a black fabric and attached to a wooden frame. A man’s mantle (llacota) of the Aymara people from the highlands of the Bolivian Cordilleras. Woven from the wool of alpaca camelids, it is composed of two panels of equal size joined at the centre. These traditional Indian textiles are always decorated with stripes of varying widths which offer a lively contrast to the large free spaces of the ground, and the vibrancy of their rich, luminous colours is impressive. Different arrangements of the stripes have produced a variety of compositions, some featuring an empty central field and some emphasising the centre, like this example. The two white stripes at the centre are embellished with motifs woven into the fabric. – Slight signs of age and wear, good overall condition. This narrow, dark red cotton cloth has a centre accentuated by fine white vertical stripes and two end panels each decorated with a rectangular compartment and three horizontal bands. It is an extremely fine warp-faced plain weave on red and white warps. Drawn in red on a white ground, the designs of the end panels consist of various diamonds, undulating lines and X-forms, and as in all Indonesian textiles, they are imbued with deep symbolic meaning. – The textile was woven by the Simalungun Batak tribe who live in northern Sumatra, south of Lake Toba, and used to be a ceremonial headscarf (bulang) worn by a woman. A comparative example is in the Australian National Gallery (1984-256). – Mounted onto a black fabric, a few loose threads, good overall condition. 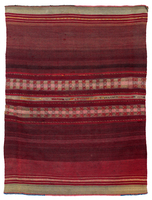 This cotton skirt (tapis) composed of four panels is a weaving of the Atoni people of West Timor. 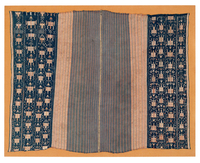 The two outer bands, each with four rows of highly abstract figures embroidered on a blue ground, represent a gallery of ancestors, while the two central bands are embellished with fine stripes. – Good condition. Mounted onto a light brown fabric and attached to a wooden frame. The Ngada live in the island of Flores in the south of the Indonesian archipelago. Woven in cotton in white and red ikat motifs on a dark blue ground, this woman’s skirt (lawo butu) of the Ngada people was worn at ceremonial dances. The traditional design of horizontal stripes of varying widths, including bands of small symbols, adorns the two end panels of this item. The large panel at the centre of the field is decorated with white animals and diamonds and framed at the sides by outer borders of stepped forms. Two design stripes depicting animals are seen above and below the central panel. Ngada ceremonial textiles are often embroidered with additional designs composed of glass beads (see example in Maxwell), but this item only has a string of multi-coloured beads attached to its upper end. – Damaged upper finish, several major holes and darned areas. The Toraja are an indigenous ethnic group who live in a mountainous region in the southern part of the island of Sulawesi (now Celebes). This long, decorative cotton band featuring indigo designs in the batik technique on a white ground was made by the Toraja for use on ceremonial occasions. Similar to Turkmen decorative bands, the design consists of various sections which differ in ornamentation. Several of the compartments include representations of humans and animals. – Signs of wear, minor tears and holes. 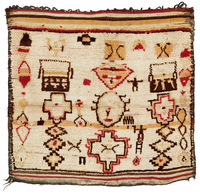 This small and nearly square rug was used as a saddle cover or a sitting mat. The pile is sheep’s wool while the warp and overcasting along the sides are brown goat hair. As in all weavings by the Rehamna tribe who live in the Haouz region north west of Marrakesh, both ends terminate in a coarsely woven striped kilim. Most of the Rehamna rugs have red grounds, and examples woven in a white ground colour are exceptions. The simply conceived design of mainly geometric shapes, dominated by brown or red outlines and largely dispensing with any interior drawing, is mirrored around the vertical bar of four larger motifs. Three small, abstract, geometric human figures are asymmetrically arranged in the field. – Good condition.